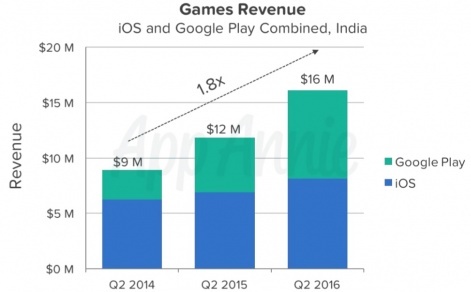 While a recent report by App Annie and NASSCOM showed that the Indian mobile games market is set to grow to $1.1 billion by 2020, it also highlighted that it's a market still dominated by Western games. 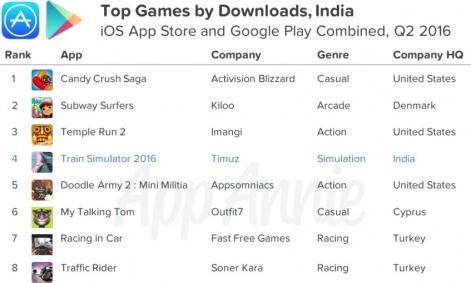 Candy Crush Saga, Subway Surfers and Temple Run 2 made up the top three games by download in India in Q2 2016, across both the App Store and Google Play. However, an unfamiliar presence at number four - and the only Indian-developed game inside the top ten - was Train Simulator 2016 by a developer called Timuz. It's the only studio currently competing with major Western competitors for downloads on its home soil, but what is Timuz and how has it got here? “We have been developing games for the past six years now,” says Timuz Managing Director Ahmed Mohammed when we catch up with him at the NASSCOM Game Developer Conference 2016. “Initially we started with Flash games for web, mostly targeting smaller children for the first two years, then we slowly moved into the mobile industry. From humble beginnings of “only four people in a very small office,” Timuz is now nearly 100 people strong with offices in Pune, Bangalore and Malaysia in addition to its Hyderabad headquarters. After a slow transitional year in which it only launched a single game on mobile, the team has since hit its stride with a hectic release schedule that's seen it launch more than 500 games and rack up 70 to 80 million downloads. And the team is a diverse bunch, too. “We're targeting the global audience as well as the Indian audience, and we develop games in all genres,” says Mohammed. We're targeting the global audience as well as the Indian audience. That approach has resulted in a catalogue spanning casual match-3, first-person shooters and simulation titles to name but three. Timuz's global approach is important too, with 40% to 50% of its users based in the US. Its native India is its second biggest market, playing host to 30% to 40% of its players. The way Timuz ensures that it monetises all of these players - including India's notoriously low-spending mobile gamers - is through interstitial advertising. While yet to adopt increasingly commonplace techniques like incentivised video ads, Mohammed still reports that 70% of the firm's revenue is generated from ad revenue. Predictably, this figure is higher in India, where only 15% of revenue comes through in-app purchases - and “only around 1%” of players spend money. However, for even 15% of revenues to come from in-app purchases in India is higher than the average. Mohammed says it's been able to make money in India “because we have a couple of games with lower in-app purchases of 10 Rupees”. Worth $0.15, this new minimum IAP tier was introduced specifically for the Indian market by Google Play back in July 2015. “We've found it to be good,” reflects Mohammed, explaining that it's led to more players spending little and often. However, Mohammed still has concerns about how best to approach the domestic market. Carrier billing is going to have a small impact, not major or huge. “IP-based games do good, but when you look at the revenue numbers, it will not justify the IP,” he considers. He is, however, encouraged by the introduction of carrier billing, a system that Timuz is currently in the process of integrating. One game that has proven successful for Timuz in its homeland is the aforementioned Train Simulator 2016. But what does it mean to be the fourth most downloaded mobile game in India for a quarter? Mohammed tells us that the game was most successful in India, racking up eight million downloads there and four to five million in all other markets combined. And while this is the most successful example, he adds that the firm has seen a similar enthusiasm for the simulation genre in India on other titles, highlighting a potentially lucrative niche. An interesting sidenote is that Train Simulator 2016 flouts Indian best practises by weighing in at around 75MB - relatively large for a market where file size is often considered critical. For Mohammed, it's about perspective. “There are many, many users [in India] who are on 3G or 4G connections with higher end devices,” he states. In contrast to the niche occupied by Train Simulator 2016, Timuz also appeals to a global, primarily female audience with its match-3 games. The casual female audience are more loyal... they play for an hour or two. It's released around eight to 10 of these, and Mohammed reports that “they have been a huge success for us". And interestingly, in contrast to many of the mobile games industry's accepted truths, these match-3 players are said to be playing and spending much more regularly than those of the more core games in Timuz's catalogue. However, given the differing audience breakdown of each, this might say more about the respective playing habits of the Indian and Western mobile audiences than how users are engaging with different genres. Timuz may be yet to launch a truly massive hit, but it's nonetheless a company that's grown from four to around 100 employees. Not only is this a relative rarity for an independent games studio in India, but Timuz has also done it without taking funding. Already competing with global big hitters in India, it's also generating considerable revenue from the dominant US market - not to mention in multiple genres. Whether the firm's strategy is a case of stretching itself too thin or a stroke of genius remains to be seen, but the point remains that Timuz has quietly become the biggest Indian game developer you've never heard of. for publishing an Amazing Article and supporting us. Awesome article! More power to Indian Game Devs! We proud about games developed in India.